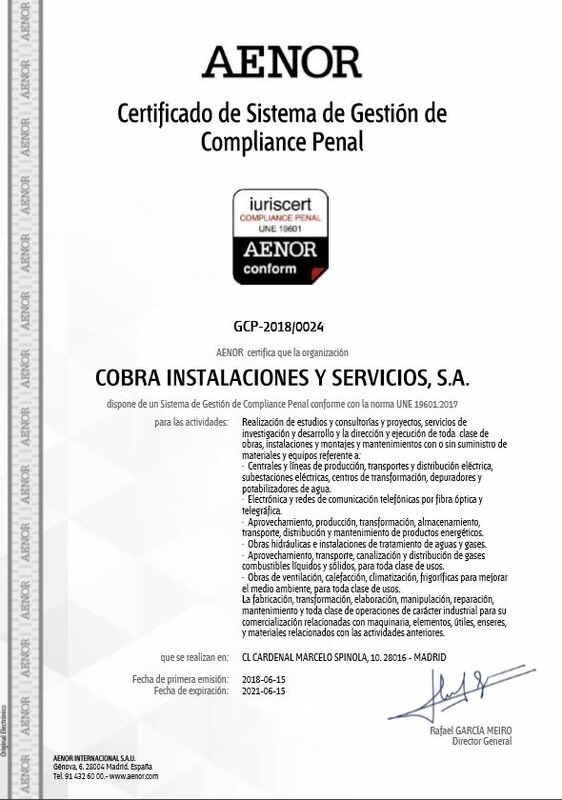 In June, Grupo Cobra obtained the AENOR certificate accrediting the implementation of a system of regulatory compliance, as established in the UNE regulation 19601. This normative complies with the Constitutional Law 1/2015, dated March 30th, which modifies the Criminal Code, to take into consideration the management model for the prevention of criminal offences as a possible factor for exoneration and mitigation of the criminal responsibility of the legal entity. Obtaining this certificate demonstrates that there is a system in place that prevents the perpetration of crimes, reduces the penal risk and reinforces a culture of legal compliance. In addition, it provides a competitive advantage for the Group by promoting trust from third parties (customers, suppliers, business partners or authorities), as well as in the tendering processes for both public and private projects.